Cabot Cloth Bound, 8 oz.(avg.) Wedge - A handsome, natural-rinded, English style cheddar, skillfully aged for a minimum of 10 months in their cheese cave to produce a flavor profile that is at once sweet, savory, nutty and tangy. Bayley Hazen Blue, 8 oz.(avg.) Wedge - A natural-rinded, cave aged, blue cheese named for the iconic Bayley Hazen Military Road that traverses the Northeast Kingdom of Vermont. 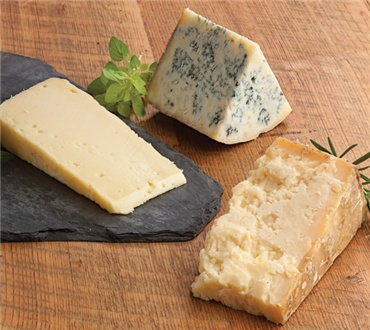 The usual peppery spice character associated with blue cheese takes a backseat to sweet, nutty and grassy flavors from the milk which comes from their herd of 45 pastured, Ayrshire cows. Our Smoked cheddar is a gentleman's cheese. It is the cheese that does not mince words and gives you a firm handshake. Cold-smoked over hickory wood in the classic Vermont tradition, this natural raw artisanal cheddar comes to life somewhere between creamy, savory, and proud. With hints of salt and bacon, this sixty-day recipe is one of our best sellers, with enough grit as is, melted, or on a sandwich. The Plymouth Cheese Factory is the second oldest cheese factory in the United States - producing high quality and distinctive artisan cheeses for over 125 years. These are divine cheeses: everything a cheesehead would want in a sampling of really quality cheeses. The contrast between them is interesting and stimulating, so they'd be appropriate to put out as a group for guests to savor. But I like slicing off a bit (or two) just one at a sitting, to eat with some French bread and a little butter and a glass of wine...makes a delightful lunch! The cheeses make good snacking, but the bleu makes great dressing (sour cream, lemon juice, fresh cracked pepper, and a touch of sugar). LOVE THESE CHEESES WITH GOOD WINE. THEY ARRIVED WRAPPED NICELY..VERY PROFESSIONAL. THEY ARE QUALITY CHEESES. WILL BUY AGAIN AMONG OTHER PRODUCTS.